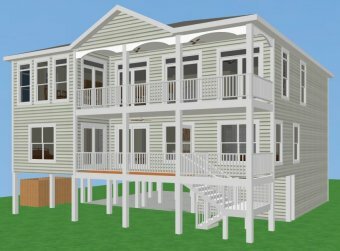 Residential Additions-Menu-Carolina Coastal Homes, Inc.
Click on the design icon for detailed project information. The renovated home maintains the basic floor plan on the first floor with the addition of a family room, a media room, and a passenger elevator. The second floor added a master bedroom, sitting area, and walk-in closet, along with access to the passenger elevator. This floor was reconfigured to change an existing bathroom into a hallway to the master suite, and to change a bedroom into a spacious master spa bathroom. This renovation involved the addition of a second floor and the redesign of the first floor of this waterfront home. This spacious beach house is now ready for guests with 6-bedrooms, 5.5 bathrooms, a vaulted great room, a modern kitchen, a formal dining room, and a utility/laundry room. There were even 2 outdoor showers added to wash off sandy feet. This project added 26'8 to the front of this waterfront home along with a passenger elevator on the left side. Bi-level front decks and a 12' x 12' sundeck on the rear were also added to take advantage of the views. By adding 881 sq. ft. of living space, this 4-bedroom, 2-bath home became a 6-bedroom, 4-bath home with a family room and a renovated kitchen with a dining room. The lower level was enclosed for security and a garage and storage added. 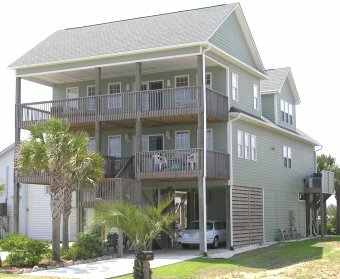 This residential addition extended the front and rear of the home to reconfigure the floor plan to accommodate the homeowners updated coastal lifestyle. This residential project involved the seamless addition of 23'5 of depth to the front of the existing house. The renovated home maintained the basic floor plan with the addition of a large living room and a master bedroom suite with laundry facilities. 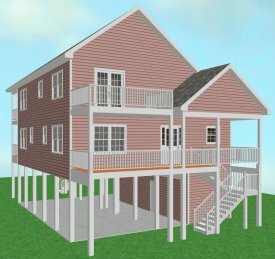 This residential addition, was uniquely designed to maintain the cottage charm of this coastal home while raising and converting the existing single-story home to a two-story home. This renovation project involved the redesign of the master bedroom suite with the addition of a spa bathroom, and the addition of a sunroom with a gas fireplace and a 16 x 16 open deck onto the rear of the house. This residential addition project renovated an existing single family home and added a new second story. The result was an inverted, open floor plan, with guest accommodations on the first level, and spacious living areas, along with a privately situated Owner's suite, on the second floor. This project involved the addition of 5' to the width of this custom coastal cottage and the relocation of the internal staircase. This renovation will provide the homeowners with additional living space to allow for a modernized kitchen and an enlarged living room with a gas fireplace. The front covered porch was also modified to provide added space for outdoor entertainment. This project involved the addition of a 1536 heated sq. ft. second level above the existing first floor structure. This 2nd floor now allows for a spacious open floor plan for the main living areas of this home. 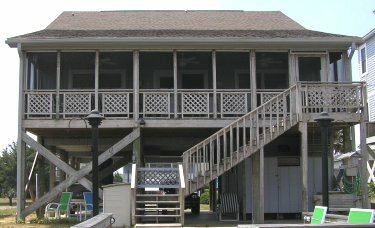 Front stairs, covered porches and rear decks were added to maximize the surrounding views of the Atlantic Ocean and the Intra-Coastal Waterway. This project involved the seamless addition of 568 heated sq. ft. of living space to the first and second floors on the rear of this residence. The garage was also extended to align with the addition above. A large open deck on the ground level, a screened porch on the first floor, and a covered porch on the second floor were also added to the rear of this home. The passenger elevator was extended to the second floor.. This project involved the replacement of the entire 2nd story of this home to provide a 938 sq. ft. vaulted master bedroom suite and 660 sq. ft. of open deck wrapping around 3-sides of the house. A 455 sq. ft. covered porch set under the second floor deck is also added to the first floor of the home. This project involved the addition of a second floor atop the existing first floor of this home. The 1284 sq. ft. addition will provide a spacious master bedroom suite accessible by a new internal staircase and a new passenger elevator. Also, 168 sq. ft. of open deck is being added along the front of the second floor to provide a clear view of the Atlantic Ocean. This project involved the seamless addition of 1231 sq. ft. of heated living space on two floors at the rear of this coastal cottage. This additional space provides the homeowners with a large living room on the first floor with a new staircase to a private master bedroom suite on the second level. 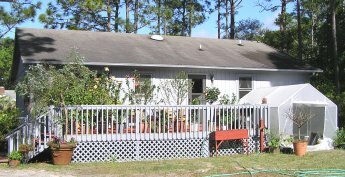 A rear covered porch and sundeck were also added to the rear of this home. This project involved the addition of 1412 sq. 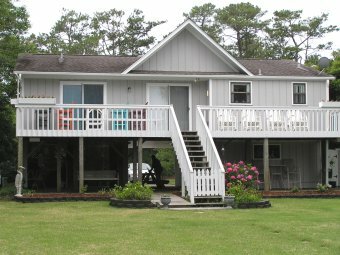 ft. of heated living space on two floors to the side of this oceanfront coastal cottage. This provided the homeowners additional living space that now houses a passenger elevator. This project involved the seamless addition of 183 Sq. Ft. of heated living space and an additional 16'8 x 20'4 garage to the right side of this transitional brick home. This project involved the complimentary addition of an adjoining single story octagonal shaped building. 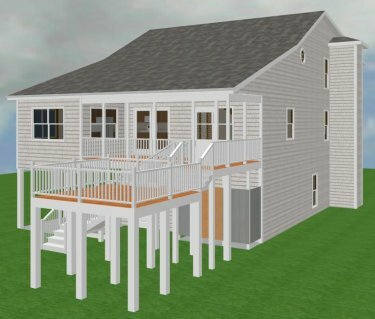 This new space is slated for use as a home office, and is built on pilings and attached to the front of the existing first floor on the front of this coastal home. This project involved the seamless addition of 442 heated square feet to the front of this beach cottage. 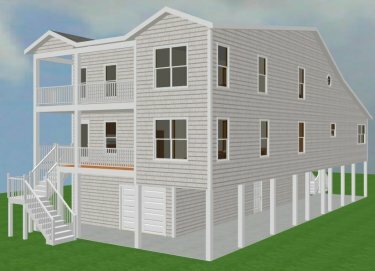 This new area provides an oversized bedroom suite, covered porch and a screened porch. A new staircase from ground level to this new space is also provided. This project involved the addition of a 3-car garage with 1610 sq. ft. of "guest living space" above it. This addition was connected to the original residence by a newly created breezeway. This project involved the addition of a 14' x 22' single story room onto the rear of this coastal home to enlarge the interior living space. A large covered, open deck now adjoins this addition to take advantage of the seaside views. This project involved the addition of 1913 sq. ft. of living space. A large HCAP wing, housing a physical therapy room, full bath, laundry facilities, and a storage closet, was seamlessly added behind the existing garage. A spacious sundeck with a spa now adjoins this new wing along the rear of the house. This deck also adjoins a new family room set off the existing kitchen. This family room opens to a new screened porch on the right side of the house. A garden shed and a covered carport were also added to this home. This project consisted of converting a second story open deck into functional/ dormered living space for use as a home office. This space now has beautiful views of the Intracoastal Waterway and the quaint town of Southport. This project involved a two-story addition, built on pilings, to join with the existing first and second floor elevations on the left side of the house. 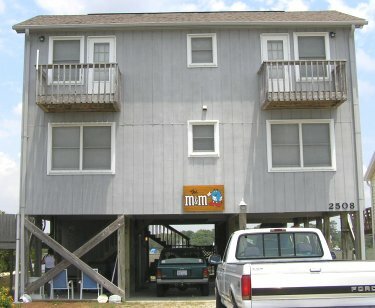 This provides additional living space on both levels that enjoy waterway views. This project involved the seamless addition of 445 sq. ft. of heated space to provide a new vaulted living room, an additional bathroom and an expanded dining area. 310 sq. 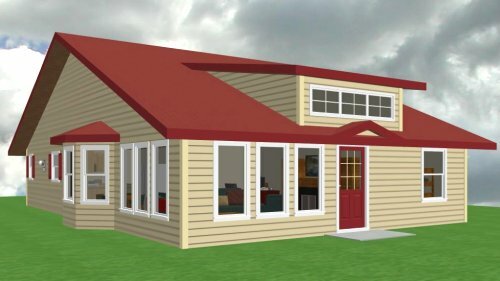 ft. of porches and 261 sq. ft. of open deck were also added to the rear of the residence to maximize the coastal views. This project involved the two-story addition of 1280 heated sq. ft. onto the rear of the existing residence. This additional allowed the homeowners to oversize their existing kitchen, and add a playroom, exercise room and office to the first floor, and to add a spacious master bedroom suite on the second floor.